On the heels of a massive successful North American tour, legendary & award winning melodic drummer Terry Bozzio is releasing rare and unreleased music digitally via his official website! Terry has worked with Frank Zappa, Jeff Beck, Korn, UK, Missing Persons, Mick Jagger, Robbie Robertson, Allan Holdsworth, Tony Levin, Steve Vai, Quincy Jones, Ken Scott, Metropole Orkest, SMAP, Loudness’ Munetaka Higuchi & “X” Japan’s Hide – as well as Film score composers Basil Poledouris, Mark Isham & Patrick O’Hearn – see more at http://www.terrybozzio.com – Grammy winner, RockWalk Honoree, Modern Drummer magazine’s Hall of Fame Award, Rolling Stone’s Top 5 Drummers of All Time! Recalls my Native American experience performing Tony Hymas’ “Oyate” project, from which sprung the Lonely Bears. I’ve never finished it over the years until now, because of technology problems (computer not fast enough to mix – midi & sync problems, & not enough track space to do overdubs etc!) but I always liked the compositional approach to the drum parts! I look at it as a missing link between guitarshop, and melodic drumming & the ostinato! The period after recording the drums included doing the lonely bears & polytown & changing to Mapex, then DW as well. I have a new track to release. It’s called “Advent”. It’s the first in the Terry Bozzio Solo Project 1991 series. I went into Jeff Burton’s garage studio (he is the son of Elvis Presley’s famous guitarist James Burton! ), with Missing Persons’ Live Sound Engineer (who has been my dear friend from the very beginning of that band), Gary Epstein. We recorded my drums on Jeff’s 16 track 2” machine. One thing we tried right away was to float in some vocal stuff I had done with Patrick O’Hearn in his studio at previous session a year before. The result was very good and inspired me to do more with other previous recordings. At that time I was living near Jeff in Studio City and had converted my garage into a little studio too. I called it White Rooms. I had a 3M 79 16 track 2” machine (bought from Gary Wright!) as well, & some early midi equipment and started to drag the midi overdubs via a sync tone from the 3M. A very slow and tedious process at the time! I’m still not finished with all the tracks, but I have 4 almost ready to go, & coming soon! This is the first and it’s called “Advent”. It means “a coming”. Burning drums, Bulgarian Folk Singing, and driving sequencer parts. I hope you like it! Drum Legend Terry Bozzio Presents a Solo Musical Performance on World’s Largest Tuned Drum & Percussion Set on Forthcoming US Tour! Los Angeles, CA – Drum legend Terry Bozzio, known for his work with Frank Zappa, Jeff Beck, UK and his critically acclaimed solo ventures, celebrates his latest release “Terry Bozzio Composer Series” with “An Evening With Terry Bozzio” US tour! This will be a night of solo drumming and include compositions from throughout his career, as well as improvisation. It is by no means a clinic or a workshop. Enjoy an intimate evening of Terry Bozzio and his monster sculpture of a drum kit together in seated venues across the US. 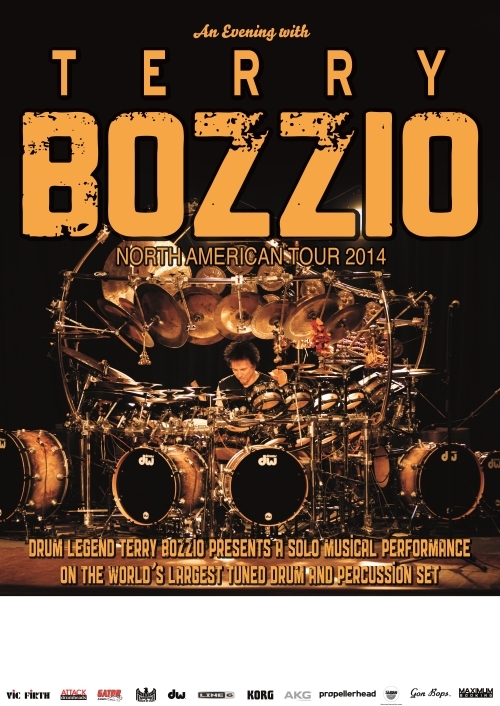 “TERRY BOZZIO – An Evening of Solo Drum Music” is a unique, intense, dynamic, spiritualistic, melodic, orchestral, atmospheric, and musical performance on the largest tuned drum & percussion set in the world. Unless you have seen Terry, you have no idea what you are in for. Bozzio is an enigmatic, evocative, and engaging musician whose instrument just happens to be the drums. Terry Bozzio is able to accompany himself with bass note patterns and, at the same time, melodically solo on top with highly developed coordination skills to express a complete musical statement on the drum set alone. Drawing from jazz, classical, & ethnic percussion styles from around the world, Terry Bozzio is “a storyteller,” able to weave a hypnotic spell over audiences and enthrall them with an eclectic experience filled with contrast, variety, intimacy, excitement, & passion. Terry just finished a sold out Tokyo show called “The History of Terry Bozzio”, w/ a Japanese All-Star Band, filmed for TV Broadcast and an upcoming DVD (Oct. release – Ward Records). He performed and sung tunes from his past recordings w/ Zappa, Beck, UK, Missing Persons, Bozzio Levin Stevens, Brecker Bros. & Billy Sheehan! Terry plans to mount this show in Europe & the US in future. Los Angeles – Legendary & award winning melodic drummer, Terry Bozzio is releasing worldwide, what he calls a “Life’s Work” project of Art & Music on the Japanese label Ward Records in December 2015. Bozzio is embarking on a world tour to promote it starting in Japan and Europe in the fall of 2015 & continuing throughout the US & other territories in 2016. Terry has worked with Frank Zappa, Jeff Beck, Korn, UK, Missing Persons, Mick Jagger, Robbie Robertson, Alan Holdsworth, Tony Levin, Steve Vai, Quincy Jones, Ken Scott, Metropole Orkest, SMAP, Loudness’ Munetaka Higuchi & “X” Japan’s Hide – as well as Film score composers Basil Poledouris, Mark Isham & Patrick O’Hearn – see more at http://www.terrybozzio.com – Grammy winner, RockWalk Honoree, Modern Drummer magazine’s Hall of Fame Award, Rolling Stone’s Top 5 Drummers of All Time! All discs are enclosed in a hard-cover book along with Terry’s hand-drawn paintings and commentary (includes Japanese translations), with Terry’s autograph. Fans purchasing the Premium Edition could participate an album listening event and autograph session with Terry Bozzio on 18th December 2015 *Details to be announced at a later date. Like an instrumental array from some H.R. Giger dream, this one-of-a-kind behemoth is more evocative and beautiful than most big-city urban art. It’s maybe the only solo kit out there that could break Neil Peart’s heart. For the rest of the review, please visit the Orlando Weekly website! Terry Bozzio — one of rock drumming’s most formidable and brain-circuiting forces — is currently touring America, playing solo dates on “the world’s largest tuned drum and percussion set.” Best known as the hurricane behind Frank Zappa’s late-Seventies and early-Eighties work, and the hit-maker behind new wave powerhouse Missing Persons, Bozzio, 63, is hoping to shed his reputation as technical solo shredder. 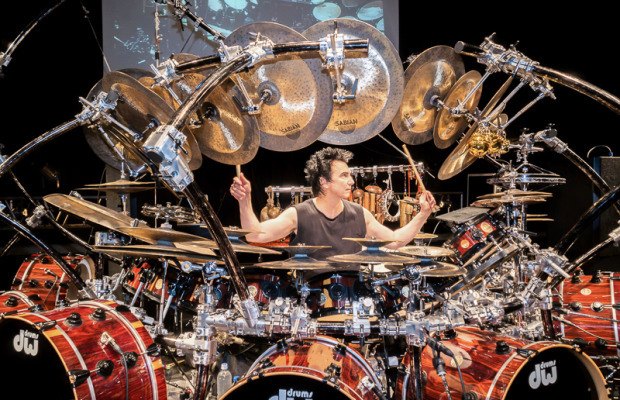 Following successful tours in Europe and Japan, “An Evening With Terry Bozzio,” is the first time he’s touring a melodic solo percussion performance in North America — hitting 40 dates, playing on two-and-a-half octaves of tuned tom-toms and eight notes of bass drum. We caught up with him to ask the drumming legend exactly how he’s lugging this thing across America. Man, I’m in hell right now! I’m on my way to San Diego for the first gig of the big tour here and we snapped a serpentine belt in my SUV, so we’re trying to find a garage to fix it in and make the gig on time. So, wait, are you doing this tour in your own SUV? Yeah, I always do that. We tow a trailer with my drums — it’s me, my wife, and my tech — and that’s how we do it. So this is your first solo tour of America doing this? Yeah. Essentially for me, personally, it’s like doing same thing, different day; it’s just packaging. My problem’s always been how to market myself, so now I have a booking agent and a press guy who’s come to bat for me and they believes in me. The idea of a solo drummer is a difficult thing to get across to people. They think of the thrashing and bashing of a typical rock-concert drum solo. And what I do is not that [laughs]. So, basically, I’ve been doing the same type of playing under the guise of a drum and cymbal commercial for 25 years — maybe 30 years now — for Sabian or Drum Workshop drums. And what I’m doing now is taking it to a more public level. So, what I do, is my drums are tuned to chromatic and diatonic pitches and I have, I guess, I have two and a half, three octaves or so of notes to play on the toms. And then I have the eight different white notes of the piano as my bass drums. So I’m able to accompany myself much the same way a pianist would — with his left hand playing the bass notes and the right hand soloing against it. And that’s how I approach the drum-set. It’s very melodic, it’s compositional — it’s also improvisational — but I improvise in a compositional matter, it’s not just patterns and shredding and crap that you go, “Man, this guy does that perfectly. If on only if it meant something, you know?” L.A., it seems, has a glut of those kind of players that are just really enviable in their technique but don’t really say much, or maybe they don’t want to something that would make a producer not hire them for a session. So, for myself, it’s a pretty much a complete musical statement on the drums, and it doesn’t lose the primitive and the bashing and that fiery rock stuff that happens on the drum set. Otherwise, I’d just be a pianist or a marimba player. For the rest of the interview, please visit the Rolling Stone website! Iconic drummer Terry Bozzio took time during his hugely successful world tour to talk to Local Band about his new music and his new art. Bozzio incorporates his new interpretive art which is appropriately named: [RHYTHM] + [SKETCH] into the visuals of his world” tour de force” to create electrifying and highly personalized impressions of sound and art. Terry is probably best know for his work with Frank Zappa, Missing Persons and the progressive rock revival group, UK. However, the artists credits extend much further than that. Starting in the early 70′s the ambitious drummer made appearances with some of the most well known and respected artists in the industry and is perhaps one of the most sought after percussionist around. For tour dates, artist information and some great video promos visit Terry’s site: TerryBozzioArt .com & Terry Bozzio.com. Please enjoy a conversation with Terry! LBFH: Terry, Your rig has grown into what has to be one of the most sophisticated in use today. Is this a self creation or have you collaborated with others to bring this “sound sculpture” to life? TB: It’s my ideas and a lot of personal labor! But of course it’s possible because of the generous support of DW Drums, Sabian Cymbals & my other sponsors. LBFH: Your performances now incorporate a lot of electronic, computer and visual technologies, Is this tricky to work with live? TB: It’s all pretty fail safe. I spend a lot of time making things easy for me & my techs who set up and move it. Any ambient music loops are in an iPod & the Roland midi system w/ Pintech triggers is probably the most complex signal chain. But it’s very reliable. For the rest of the interview, please visit the Local Band for Hire website! Drum legend Terry Bozzio, known for his work with Frank Zappa, Jeff Beck, UK and his critically acclaimed solo ventures, celebrates the 50th anniversary of his first drum lesson with “An Evening With Terry Bozzio” coast-to-coast North American tour! During the course of this tour, Terry Bozzio will hit over 40 cities from San Diego to Jacksonville to Montreal to Vancouver to Los Angeles and everywhere in between. This will be a night of solo drumming and include compositions from throughout his career, as well as improvisation. It is by no means a clinic or a workshop. 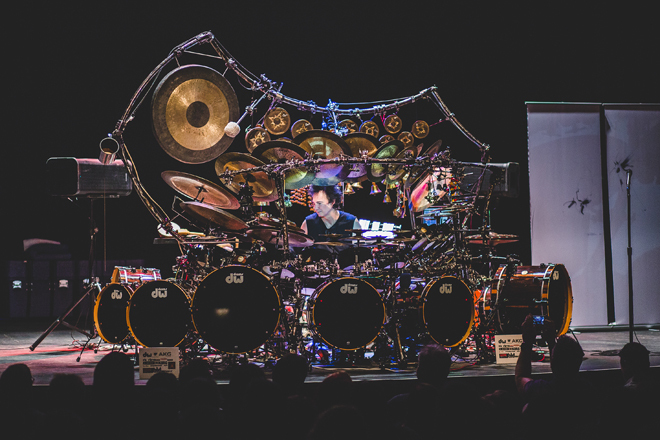 Enjoy an intimate evening of Terry Bozzio and his monster sculpture of a drum kit together for the first time in seated venues across North America. 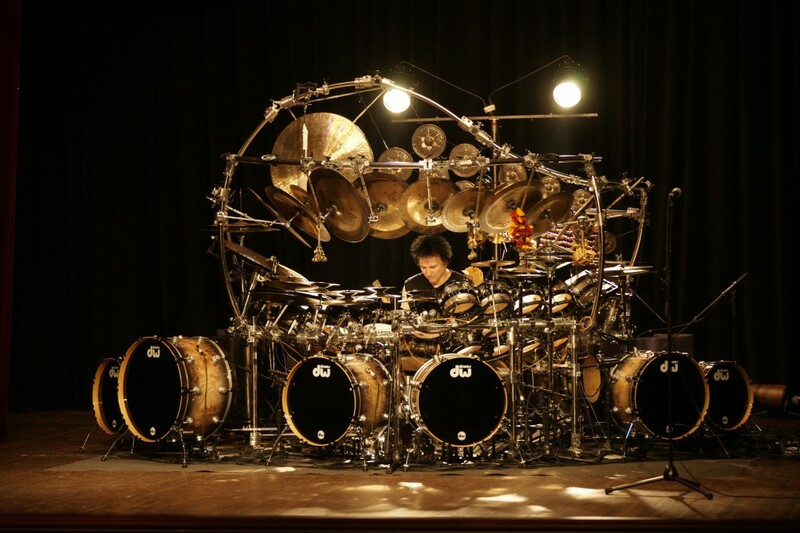 In other news, over the last four decades drummer Terry Bozzio has built an extraordinary legacy based on his unique approach to rhythm and the diverse and acclaimed recordings to which he’s contributed. For the rest of the bio and the interview, please visit the Exclusive Magazine website!